Keeping guard over the town is the Torre de la Fortaleza the only remains of a once impressive castle. 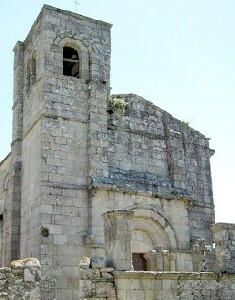 It is believed to have been built in the 13th century but was destroyed during the Irmandiño uprising in the 15th century. 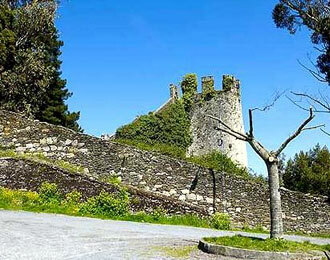 The castle was rebuilt and was lived in by the Merinos and then the senior judges of the Marquis until 1730. In 1860 the town council along with Don Manuel Pérez Batallón purchased the castle and many of the stones and the other towers were sold off to the townspeople. Originally the castle had four towers, dungeons, pits and buttresses but the only part that remains now is the south east tower with its open stairway and two shields with the coats of arms of Castro, Enríquez and Osorio. Unfortunately you can't visit the tower but the council are in the process of renovating it as a museum so you may be able to some time in the future. The 19th century Iglesia de Santa Mariña is located on the Rúa Maior next to the ancient Praza do Mercado where markets were held every Sunday up until the 1950's, now known as the Praza de D. Juan Mª López. The current church was built over the ruins of a 13th century church and inside is a drawing of the original church's door and capital. The church has a distinctive pyramid style tower that contains a clock. Depending on which way you approach the church you will see a mural on a side wall depicting pilgrims making their way to the church. 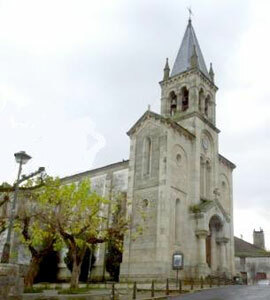 On your way out of Sarria you will pass the 18th century Capilla de San Lazaro the only remaining part of Sarria's principal pilgrim hospital, el Hospital de San Lazaro. This hospital was known for taking in lepers who were making their way to Santiago with the hope of a cure, along with those pilgrims with other contagious diseases. The Rúa Maior, the main street through the town also has some grand houses intermingled with the modern apartment blocks. It is also along this street that you will find a number of the albergues and most of the cafés, restaurants and shops. There are 7 albergues in total plus 4 hostals. These can get very busy as Sarria is considered the starting point for those pilgrims who are doing the short 100 kilometre Camino to Santiago. To leave Sarria walk down the Rúa Maior towards the Monasterio de la Magdalena and take a left past the cemetery and cross over the medieval bridge Ponte Aspera. The track follows the railway line for a short while when you will then have to cross over it at Sancti Michaelis. The path continues parallel to the railway line and goes across a footbridge and up through some woods and passing through the small village of Vilei and eventually after about 4.5 kilometres into the village of Barbedelo. The village of Barbadelo has been here since the 10th century and has a 12th century church which has been given national monument status because of its frescoes. It is believed to have originally been part of a monastery that had at one point come under the control of the monastery at Samos. There is a small albergue here run by the Xunta which says it has cooking facilities but there are no utensils. A little further down the hill is the Casa del Carmen that offers accommodation and has dining facilities also. Walk through the village and through woods towards the village of Rente which has a private hostal and a couple of bars. 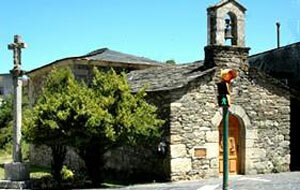 From Rente follow a tree lined track passing a modern fountain with the water coming from a pilgrim's mouth and through the village of Marzán O Real. Walk through some more woods and through the village of Leimán and on to the village of Peruscallo where you will find a bar with a restaurant. The path now goes down a lane through the hamlets of Cortiñas, Lavandeira Casal and Brea. At Brea you will spot a marker telling you that there are only 100 kilometres left on your journey. Continue along the path and into the village of Morgade where you will find a café that offers delicious cakes and accommodation in a private albergue next to the bar. Walk through the village past the abandoned chapel and walk down the track up to the villages of Ferreiros and Mirallos. They are very close together and here you can get accommodation at a couple of albergues and a couple of cafés one of which offers a pilgrim menu and is also open for breakfast. The bar restaurant is only open during the summer. The path now takes you through the hamlets of Pena and Couto-Rozas, both of which have fountains, then through Pena dos Corvos, Moimentos and Cotarelo Mercadoiro where there is a new albergue with its own café and restaurant. Back on the path you will pass through the village of Moutras when the track starts to descend and it is pretty much all downhill until you reach Portomarín. Before we get to Portomarín we will go through the villages of Parrocha and Vilachá soon after which you will spot the Río Miño and the reservoir called Embalse de Belezar. Cross the very high bridge over the Río Miño and into the town of Portomarín. The area around Portomarín has been inhabited for many thousands of years as the number of castros in the vicinity testifies. The Romans occupied it and named the area Portumarini but it is said to have been Don Guitierre and the Condesa Dona Ilduana who founded the town of Portomarín in the 10th century. The town was divided into two boroughs on the left bank of the river was San Pedro and on the right bank was San Juan. With the discovery of the tomb of Saint James the town's importance grew and at one time had 3 orders of knights including the Knights Templar, Knights of Santiago and the Knights of St John of Jerusalem. This will go some way to explaining the castle type architecture of the church of San Nicolás.